Born in South Dakota, but raised in Iowa. Started in magic at the age of 5 when a neighbor borrowed a magic book from the public library and needed an assistant. He didn't actually see a live magician until late 1960's. He performed closeup for a living during the late 1970's in the Omaha Nebraska area after serving in the Air Force. He's contributed material to John Novak's Escape magazine but has kept a low profile other than that. He specializes in banquet performances and has invented/improved several tricks such as Brody's Choker, Solution 6 and VANCAN. 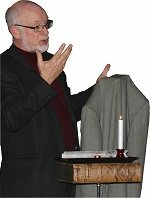 He has served as the President of the Omaha Magical Society and has lectured to several magic clubs in the MidWest. Currently resides in Omaha, Nebraska with his wife and 2 dogs. Amusing and entertaining script on the classic 4 Bean routine. Full performance rights included. The 4 Bean trick is a classic, but the moves and the motivation are odd and unexplained. Well, the author of How To Write A Script shows how he used his methodology to write a funny script where you know why the trick is being done and why the handling looks the way it does. And the handling ends up being pretty simple. The Hofzinser gimmick is an odd gimmick that has limited usage. But with a little analysis and some scripting you can make an effect that, while not magic, is still entertaining. The Hofzinser card is a gimmick, not a trick. So what can you do with it. Well, the author of How To Write A Script shows how he used his methodology to write a script that entertains even though it doesn't fool anyone. And it gives the spectators the feeling that they're seeing something from the crooked gamblers handbook. It even allows the spectators to examine the card without fear of the card being damaged. Script(s) and full handling on a routine for finding cards with your fingertips. Plays for duos, or solo performers in parlor, stage, or even closeup. Performance video included. Effect: The magician has 3 cards selected from a red deck. A spectator has also shuffled a blue deck. From that blue deck, the magician finds the exact same cards selected from the red deck using just his sensitive fingers. a duo act where one person plays the mystic, and the other is an interpreter. An breakdown in script format and full handling on making real magic with the Vanishing Wand using the Shell. Full construction details on making your own shells included. Performance video included. Anyone that's ever read Tarbell has run into the Shell Wand. An exact duplicate of a wand made from paper. But, you probably have questions. Can you fool people with it? How do you build the duplicates? How to tie a vanishing figure 8 knot and a script that makes the process more enjoyable and entertaining. Everyone probably knows how to vanish an overhand knot, or even a Chefalo knot. But how many know how to vanish a figure 8 knot? How to tie a true figure 8 knot as well as the false figure 8 knot are both shown and are virtually identical. The script provided shows how it can stand on it's own, but it would also fit nicely into a routine with knots. An audience member can even help you tie the knot, and they'll be none the wiser. A routine and script that (with an assist from Mel Mellers), transforms a rather dry piece of mentalism into a fun and entertaining piece of magic. The plot of the Add-A-Number effect doesn't lend itself to the magical performer, as the audience knows that they're watching tricks, not psychic phenomenon, which means that the presentation of "seeing the future" isn't as effective as it could be. Plus, the method is closely tied to the revelation. How could you predict a number unless you somehow knew what everyone would write or you switched the numbers? A routine, script, and performance video of the Linking Rings that restores the mystery and magic to this classic trick while still being entertaining. All of the rings are examined! Includes a performance video. 1st edition 2018, PDF 48 pages, performance video 4 min 35s. For all performing venues, the classic monte style trick, scripted in two different ways to allow the trick to be performed at any time in your parlor/stage routines. Note: The trick is not fully explained. You MUST own the trick to be able to perform this. 3 scripts - 3 different effects - 2 impromptu - for all performing venues. A fun exploration of the GILBREATH principle that not only entertains, but also hides the methodology. Most mathematical tricks suffer from a multitude of challenges, and the Gilbreath principle is no different. Stage, parlor and impromptu scripts, handlings, and a spreadsheet calculator for the Magic Matrix. A devilishly clever was to force numbers. "Ognib" is "Bingo" in reverse, is a method also known under the name "Magic Matrix" (see Martin Gardner). A complete script, handling, and a spreadsheet calculator. Handlings included for stage, parlor and impromptu. A parlor or stage trick with a single method, but two vastly different scripts using totally different props. Fun and fooling. Two tricks in one. Each with nearly identical handling but widely different effects. In ZODIAC, you show a spectator pictures, one at a time, letting the spectator say "stop" whenever they wish. Their selection turns out to have been predicted in a message hanging in full view of the audience. A free e-manuscript that explores an age old method to show the power of scripting and analysis. One of the joys of magic is going through old and dusty ideas and actually finding usable material. This is one of those. An old, old trick - routined, and scripted - that will fit into a parlor or stage act with almost no difficulty. A trick that - while not a world-beater - will still fool and entertain your audience. A trick that you can keep in your act for those days where you need just a couple of minutes more material. The Penrose knot has never been clearly explained until now. A strange effect that is not only made fun by the supplied script, but an "in the hands" tying method is revealed. The magician ties a rope into a chain of 30 knots. Each knot appears identical. The spectator grabs one of the knots. The magician now pulls on the ends of the rope, and every knot dissolves - except - the knot the spectator selected. That knot proves to be a common overhand knot. Parlor and stage magic updated. Includes a version of the 6 Card Repeat that has an actual climax as well as a Vanishing Candle you can perform within inches of the audience. One of the more difficult tasks facing magicians is coming up with scripts - of any sort. And explaining why someone is picking a word from a dictionary so that you can read their mind is - at best - difficult. A script and performance video that is based on the work of Ron Wilson and makes the Color Changing Silks a practical and mysterious trick, loaded with laughs. One of the more difficult tasks facing magicians is coming up with scripts – of any sort. And the color changing silks, using the hand dye tube, makes it even more intimidating since there are multiple steals, hand to hand transfers to make, etc. All without getting caught! Hints and tips covering everything from "The needle through Balloon" to "how to transport your act". Have you ever done the "Needle Through Balloon" and had the balloon pop prematurely? No more - not even if you use Dollar General Balloons! A script and method for the Rising card trick where the spectator goes through the deck and selects the card to rise. Can be done within inches of the audience with no sleight of hand. One of the more difficult tasks facing magicians is coming up with scripts - of any sort. A script that highlights the magic while still being relatable to the audience. This is a complete script and revised handling for the Grandmother's Necklace principle, which not only fools people, but entertains them. One of the more difficult tasks facing magicians is coming up with scripts - of any sort. Especially with a trick that is old and tread worn, like Grandmother's Necklace. This is a complete script and revised handling for the Grandmother's Necklace principle, including a variation in how the trick works. Imagine being able to control coincidence. Where the time and location of two events determines the outcome of the events. This script and full instructions explains how. Imagine being able to control coincidence. Where the time and location of two events determines the outcome of the events. Now you can! This is a complete script and revised handling for the COUNTING ON LOTHAR trick, perhaps one of the strangest and mystifying card tricks around. It allows the magician to predict the past, the present, and even the future.